I have a little confession to make – I haven’t played a Super Mario game since the good old Game Boy. Super Mario Land was a classic and it was one of the first proper platform games that I completed from start to finish. The game play was short but sweet and I’m amazed that I missed out on several other Mario games on the main Nintendo consoles. With Super Mario Galaxy, everyone’s favourite Italian plumber is back and with the benefit of the Wii’s motion sensor controls; this is by far the most impressive Mario game ever. The control system works a treat and it’s a joyful pleasure to run and jump around on different planets in glorious 3D. The visuals and level design are nothing short of breathtaking with it own sense of style and atmosphere. The game play is heavily addictive and it was quite a nice touch to have a co-op mode for the second player. Instead of them sitting there watching you playing this fantastic game, they can help by waving the Wiimote around collecting Star Bits! I have yet to complete it as I’ve been sidetracked by work and also my recent holiday to Hong Kong but considering I have to collect around 120 golden stars to finish it – currently I have 25 – then I have quite a long way to go in Super Mario Galaxy! So many other planets and galaxies yet to explore, so it is best to load this up and continue my epic quest! Citroen rally driver Sebastien Loeb is within touching distance of claiming this year World Rally Championship after taking victory in the Rally of Ireland. The Frenchman dominated the event from start to finish, but it wasn’t entirely straightforward. He suffered a suspension problem on the first day and then picked up a ten second penalty for being late out of service. Despite that, he survived the tricky conditions to win the first Irish rally event. As for his championship rival Marcus Gronholm, the Finn crashed out on the first day handing the title advantage to Loeb (the Frenchman is six points ahead as we approach the season-ending Rally GB). “The rally was really, really difficult, but we managed to finish it,” said Loeb. “Ten points more for the championship is really important. That could change a lot of things for the championship. We will see in GB. Finishing in second was his Citroen team-mate Dani Sordo, giving the team another perfect one-two result. Jari-Matti Latvala made up his Rally Japan error by claming his first WRC podium finish in Ireland. After months of delays in the development process, the new operating system for the Apple Macintosh – Mac OS 10.5 codename ‘Leopard’ – was finally release at the end of October. Apple states the new OS features over 300 new changes and enhancements, covering core operating system components as well as applications and developer tools. 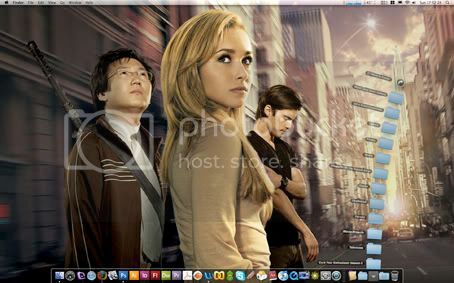 The biggest differences compare to Tiger (the previous Mac OS X) is the new and stylish look to the desktop. But before I go into this with much detail, I should explain my nightmare situation when installing the new OS on my 24-inch iMac (the classic white version, not the recent revamp silver and black model). I should have done my research online, reading the various comments on Apple forums about what was causing my Mac to crash. In fact, it was a serious matter as I thought I had lost all my personal data including my vast collection of music, videos and images due to the fact it wasn’t booting anymore… You can tell when this happens when you are stuck on the blue screen. Yes, that’s right. Windows is not alone when you come across the ‘blue screen of death’ (a.k.a. BSOD)! How so? First, the Leopard install DVD failed, claiming it was unreadable. I did a restart, try the install process again but this time my iMac disc icon become unavailable, meaning you can’t install Leopard without a Hard Drive… So I restarted it again and selected the ‘repair’ option to fix it. 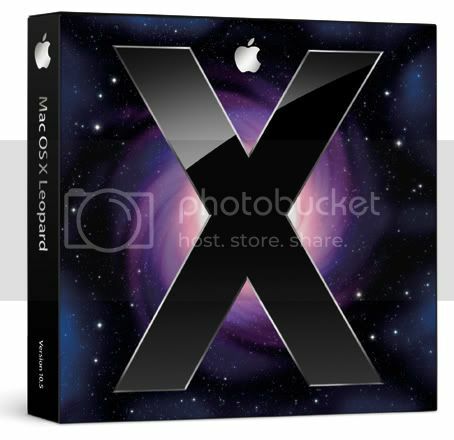 This time Leopard can ‘see’ the iMac disc icon and was now ready to install. It took around an hour to complete the installing process. After that, the machine will reboot back into the new desktop. But unfortunately, due to conflicts with APE, I was unable to get back in… It was then you are presented with the infamous blue screen. You couldn’t even hear the Hard Drive whirring (meaning disk activity) all you get was a cursor arrow in the top left corner in a sea of blue… I tried to restart the computer many times and each attempt was stuck on the blue screen. So how did I fix it? Well, I used that backup to reboot back into Tiger and from there, restore the whole system based on the clone data from my external Hard Drive. This took four hours to restore… After that, I tried again! But this time, instead of selecting the ‘Upgrade’ option that worked successfully on my PowerBook G4, I now opted for the ‘Archive and Install’ option. This time it worked perfectly and was presented with a nice CGI welcome video when I got back into my desktop! It was such a relief to see this after wasting approximately seven hours to get the damn thing to work! But now I have Leopard running smoothly and quickly, I can now explain the new features in this OS. The first thing you will notice immediately is the new appearance to the desktop. Apple has redesigned it from top to bottom, with a transparent menu bar, a 3D look to the Dock and a new dramatic feel to the Finder windows. The Finder in particular has a new party trick called Quick Look, which allows you to see a preview to a document without launching their associated application. To use Quick Look, just select a file in the Finder, hit the space bar on the keyboard and a window pops up displaying a read-only version of that document. It works wonderfully well with JPEGs and PDFs, with my personal favourite being video clips. By this, you can watch any movie files without the need to launch QuickTime or any movie player. The Quick Look technology is part of the iTunes-style Cover Flow feature in Finder. Cover Flow presents files as horizontally scrolling images of their contents (just as it does with album art in iTunes). Seeing the list of files in this format is pure eye-candy but it’s only practical if the documents are graphical like photos (it doesn’t work so well if its text-based like Word files). A new feature that comes with Leopard is called Spaces. Apple has adopted this from several other operating systems – namely Unix – by providing ‘virtual desktops’. With this, you can manage multiple workspaces with each ‘desktop’ containing different applications or file windows. This is a powerful feature as it allows you to multitask between different ‘spaces’. So for example, you can have one space for reading emails and web browsing, another for listening to your music in iTunes, another for playing a computer game while the final space can be used for organising your images in iPhoto. Apple has also added the feature of switching between spaces and even reorganising what’s running in that particular desktop. The next cool feature is Stacks. This is meant to be a new way of organising your files by creating stacks. A stack is creating by placing a folder in the Dock – when you click on the Stack, it presents a window showing the files’ icon containing in that folder. It a small and subtle feature but I must admit its not very good. I can see why Apple devised this, as it means you have a nice and clean desktop without a clutter of random files dotting all over the place. But using it is quite tricky, as you need to create multiple stacks in order to file away your documents in the correct places on your system. Right, onto Apple’s web browser – Safari. This has upgraded to version 3.0 with a new feature that allows you to devise your own Dashboard widget by selecting certain parts of a web page. These is very useful if you want to keep on score with the latest sports results or just want to read the latest news reports taken from your favourite websites. Safari 3.0 also has the ability to do tabbed browsing and you can even rearrange the windows by moving or dragging the tabs. But one of the major key features of Leopard is Time Machine. This will change our bad habits of not backing up our personal files with more ease. Time Machine allows you to travel back in time to recover a deleted file, which is very handy if you accidentally removed an important document from the system… The interface of Time Machine looks very dramatic against that star/galaxy backdrop I might add. Other new features with Leopard including an enhanced version of Mail (with the ability to modify the Apple-designed stationary, as well as receive RSS feeds), iChat (you can present your work in an iChat conversation plus have the ability to take control of your friend’s computer if you working on a project! ), Photo Booth (now with added animated backgrounds) and of course Front Row (which looks similar to Apple TV, but I have to admit I miss the animated movie clips, which are now replaced by still frame grabs). In conclusion, Leopard is a welcome addition to the Macintosh operating system. Sure the leap over Tiger is not as dramatic say from Mac OS 9 to Mac OS X, but in terms of functionality and form, it is easily the most impressive. In fact, after using if for over two weeks, I believe it is better than Mac OS 10.4 in terms of providing more scope to the user by managing and organising files. It even runs faster and I love the ability to glance at my documents without even opening the applications with Quick Look. So despite the nightmare of installing it, Leopard is worth the price and effort that has put in to it. McLaren have announced that former Formula One world champion Fernando Alonso is to leave the British team, after both parties agreed to a ‘mutual parting of ways’. The Spaniard, who joined the squad from Renault at the start of the 2007 season, originally had two years left to run on his contract but in a statement released on Friday, it is revealed that after discussion, it’s been decided ‘it would be in the best interests of both parties to bring the relationship to an end’. Over the course of the season, Alonso has expressed his dissatisfaction at McLaren, in particular not receiving fair treatment. Even though he won four races for the team and finishing third in the championship standings, the relations between the Spaniard and Ron Dennis had become increasingly strained in recent months. “He is a great driver but for some reason the combination of Vodafone McLaren Mercedes and Fernando has not really worked out, and in the end we reached a stage where none of us could find a way to move forward,” explained the McLaren team principal. “We all believe that our joint decision to part company is for the best, and we will now continue to focus on our 2008 world championship challenge. As for Alonso, he commented that, although he never really felt at home at McLaren, he still believed they were a great squad. “Since I was a boy I had always wanted to drive for McLaren, but sometimes in life things do not work out,” explained the 26 year-old. “I continue to believe that McLaren is a great team. Yes, we have had our ups and downs during the season, which has made it extra-challenging for all of us, and it is not a secret that I never really felt at home. And so it ends the Alonso-McLaren partnership… Where next for the Spaniard? Will he return back to Renault – in which he won his two drivers’ title? Perhaps there is a possible position at Toyota (following the departure of Ralf Schumacher)? Or maybe, there is a chance at both Red Bull and BMW Sauber? As for Lewis Hamilton – the championship runner-up – who will partner him in the second seat at McLaren? The rumours seem to point to three drivers who could possibly be his new team-mate in 2008. These three are: Nico Rosberg, Adrian Sutil and Heikki Kovalainen. For Adrian Sutil, it will be a dream come true if the German can drive for the top team after racing all-season in the Spyker. His pace in the orange/black car was stunning and it would be amazing if Sutil were given the opportunity to drive for Dennis. But you have to say that Heikki Kovalainen remains the favourite to land the seat. If this happens, Kovalainen would be Ron Dennis’s third Finnish driver in seven years, following Mika Hakkinen and Kimi Raikkonen. In addition, it would allow a straight swap with Renault for the outgoing Fernando Alonso. But at this stage in time, it is unclear who will partner Lewis and which team Fernando will drive for. This is all speculation so we shall wait and see what happens in this mad world that is Formula One!